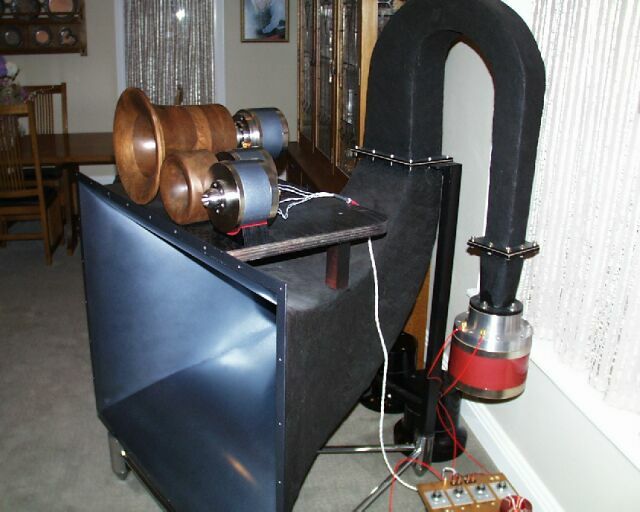 The first horns were invented by cinema sound pioneers to increase acoustic output by providing an "impedance match" between a compression driver diaphragm and the air in the listening area. This was absolutely necessary as the amplifiers at that time were only a few watts. 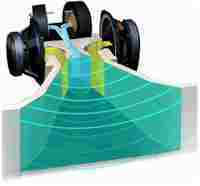 As amplifiers became more efficient and drivers more sensitive, horns were used to control the dispersion of the acoustic pressure wave. 30 years ago, the constant directivity horn was developed, and innovation allmost stopped. Sold as DIY kits - limited to 3 kits per customer! Kits include assembled wood lense and all parts needed including drivers, crossover parts, screws, brackets, etc. This technology is based on a pyramid-shaped, multi-band wave guide, to combine the amplitude and phase from a multiple number of drivers into a single coherent acoustic output. It is in effect a 2-way horn, 5 driver system including a passive crossover that effectively acts as a single driver on and off axis. 60° x 60° dispersion pattern provides superb energy time curve response over an extended bandwidth while lowering undesirable side wall and floor reflections from reaching the listener and clouding thesound. 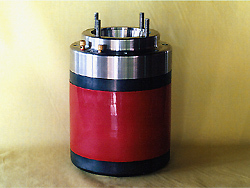 Efficiency: 103~110dB @ 1W1m with an 8ohm or higher Dimensions:16.5" x 16.5" at the mouth outer lip, 14" deep overall. Renkus Heinz - CoEntrant topology US patent #5,526,456.
constant beamwidth and directivity – as pattern control devices, they perform better over a wider frequency band than ordinary horns. The difference between a rectangular horn’s height and width can overcome the difference in its vertical and horizontal flare rates). The circular mouth has no corners to cause high frequency "feathering" and the resulting distortion. Now there’s no need to sacrifice sound quality in order to achieve controlled dispersion. Renkus Heinz calls this solution CoEntrant topology: CoEntrant topology integrates the output of multiple transducers into a single acoustic source, with inherent alignment in both space and time. CoEntrant design allows maximum acoustic power from minimal enclosure dimensions, without sacrificing effective pattern control. Normally a hordrivriver is used wity a typical midrangehorn. Some of large horns reach down to 300-400 Hz where they cross over to a hornloadet big woofer. But in comes ALE....! How anybody came on the idea to make a horndriver that could reach down to 15 Hz I do not know, but they did! Anyway you need to make your own horn to make it work and as they say "it should be designed to fit your room"! Maxmum Input: 70W, SPL: 110dB, Throat Diameter : 130mm, Diaphragm: Titanium, Magnetic Density: 23,000 gauss, Dimension: 250mm diameterx420mm height, Suitable Horn: must be design to fit the listening room, Weight: 100kg, Note: using alnico and permendule magnets. 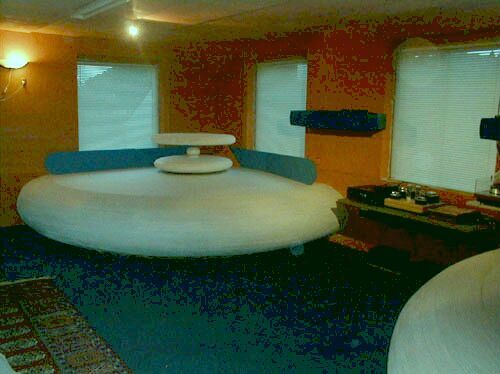 significantly enhanced. Essentially, the KF750 is a very large MF horn with the LF and HF subsystems mounted within its flare. 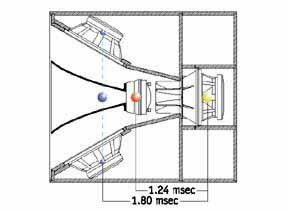 Since all three subsystems' acoustic centers are on the same axis, appropriate signal delay creates a unified space/time origin for the entire system. This results in a three-way array system that acts as a true point source. A few years ago I visited a guy in Sweden. 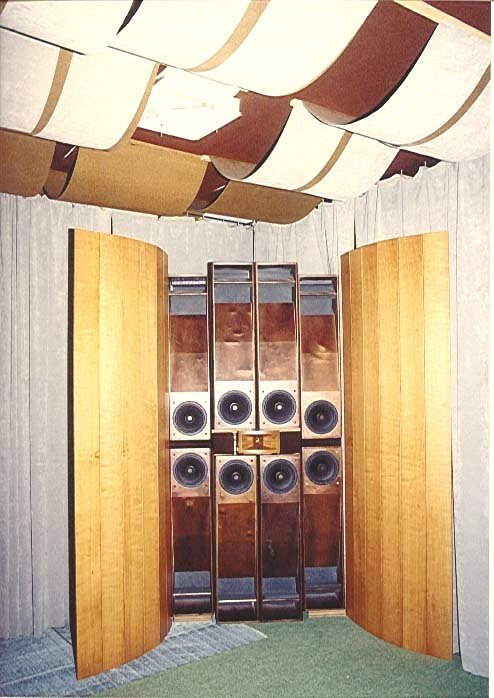 He had converted his cellar into 6 meter long horns each with a 15" JBL driver. This is by far the most realistic and dynamic bass I have ever experienced. Until recently I could not imagine anyone bettering this. When it comes to size Roberto Delle Curti, president of Aliante certainly has the largest speakers I have ever seen. 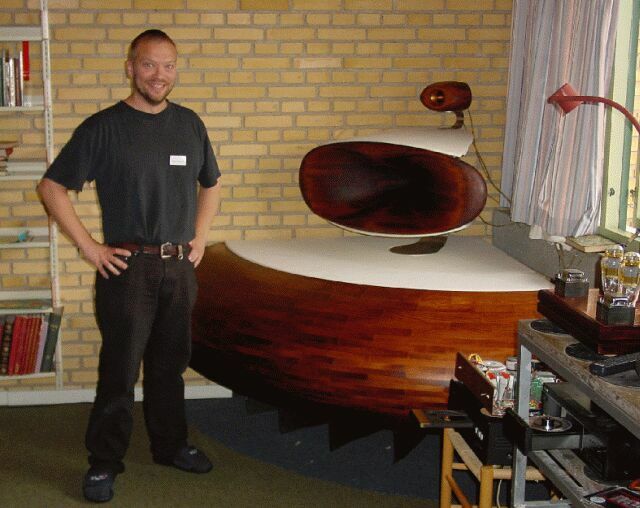 All that remains is that I take a trip to sunny Italy and get a chance to listen to these "worlds largest" speakers. The recipy is quite simple - take a big room - 6.95 x 8.70 meters - and dig! 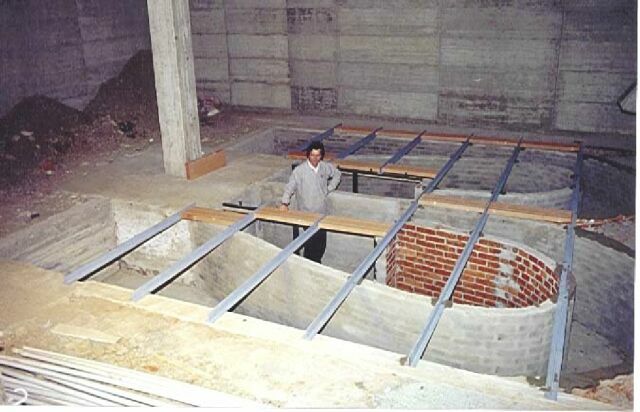 Make a very big sub using tons of bricks and concrete and put the floor back on top. Then use 16 18" woofers as drivers, combine this amazing sub with hornsystems and amplification that match in quality and power. The system features a 110 dB/1W/1 meter sensitivity starting from below 10 Hz focused on the listening position. See all the amazing pictures at the above URL. Bahnsen horns features optimized curves and expansion to guide the delicate sound waves with ease, from the front cavity of the diaphragm and the new developed phaseguide, all the way through the flare of the horn to the wide gentle coupling to the listening room. The top picture shows Peter and the Magnificator horns. This picture was taken at the Triodefestivals in 2001..The Magnificator is a big 3- way system with crossovers at 300 and 5000 Hz. Loading is 4-6 Ohm and sens. 106 dB. Bottom picture shows the even bigge horn "Roundabout". Peter claims this to be the first and only horn system with expansion 360° the entire horn length. Controlled by absorbing materials, sphere shape, and reflectors in the corner and ceiling, giving a dynamic, emotional 3-D reproduction that cant be compared to anything ever heard (Peter's words! ).